Free Viewer » Blog » Learn How to Import PST file into Exchange 2010, 2013, 2016? Learn How to Import PST file into Exchange 2010, 2013, 2016? Importing Outlook PST file in MS Exchange Server 2010 is always a difficult task. Therefore, users keep on looking for the cost-free solution of the same. Hence, in this post, we have described how to import PST file into Exchange 2010 mailbox manually. PST file or the Personal Storage Table is the data file of MS Outlook used to store mailbox data like emails, notes, contacts, calendars, etc. One can open, view and read it in MS Outlook application only. However, Microsoft Outlook is the desktop-based application, which restricts the use of PST file on desktop only. On the other hand, sometimes PST file becomes inaccessible due to any reason like corruption, virus and malware attack, etc. To overcome all such situations and increase the usability of the PST file users wants to move PST file to the cloud. Data on the cloud also ensure the security and prevent corruption also. Now, to do the same, one is suggested to import PST file into Exchange Server 2010 or any other version. In addition, Microsoft offers a powerful administration application i.e. Exchange Management Shell. This makes the import Outlook PST file into Exchange Mailbox 2010 process really easy for the users to perform manually. Hence, in the following sections of this post, various cmdlets are discussed to do the same. User Query: How to Import PST file into Exchange 2010, 2013, 2016? As nowadays, various malware attacks are going on the local machine and data is not save on the personal computers. Therefore, I need to import my important i.e. Outlook PST file to Exchange Server 2010, as it ensures data security and provides an easy access to data in the cloud also. But the problem is I am looking for the solution that can help me to import PST file into Exchange mailbox 2010 in bulk. Moreover, I am looking for the manual solution for the same, not a third-party tool. Thus, if any out there has any idea about how this can be performed manually please let me know. How to Import PST File into Exchange 2010, 2013, 2016 Manually? In order to move Outlook data file (.pst) into Exchange Server, one can use Exchange Management Shell or EMS cmdlets. 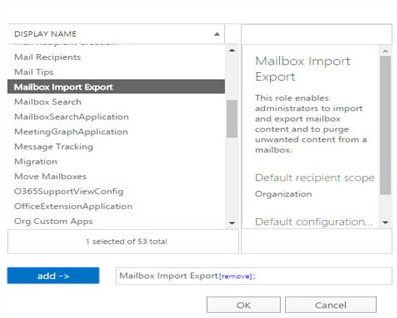 Using the Mailbox Imports Requests one can easily move data without any hassle. A user must have the Outlook 2010 with x64 installed on an Exchange Server, which has the installed mailbox role. The PST file must be saved in a shared folder, which accessible using the UNC path and make sure that Exchange Trusted Subsystem must have complete access to the shared folder. The mailbox in which one needs to import PST file must exist. Now, you can easily add the users that you are going to use to import the PST files to the just created group. Then, exit the Exchange Management Shell and turn off and restart again. There are many ways through which a user can move PST files to Exchange Server. However, one can import either single PST or multiple PST file in bulk. All the commands that are used for Exchange 2010 are same as the commands for Exchange 2007. Remember: In the single import command, the –Identity can be the display name, the email IB or the Exchange Alias. It is necessary to specify the actual PST file name when a single import is being performed. As executing the PowerShell cmdlets is always a difficult or tricky task for the user to perform. Therefore, it is always suggested to use a professional solution to have a simple, reliable and easy solution. One such type of tool is Exchange Import. It is an amazing utility that is programmed in such manner that it import PST file to Exchange Server mailbox directly. In addition, if a user wants then, one can import multiple PST file to Exchange 2010 in bulk also. Moreover, it imports all data items stored in PST file without any issue. There are many users who want to make their Outlook data safe & secure from all kind of virus attacks and corruption. To do so, one can import PST file on the cloud i.e. on Exchange Server. Therefore, in this post, how to import PST file into Exchange 2010 mailbox is covered using Exchange Management Shell. One can use this method to move multiple or single PST file based on his/ her choice. It is a cost-effective and guaranteed solution.